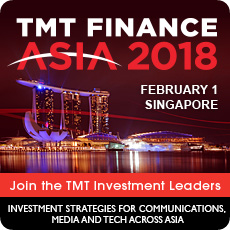 Investment leaders from leading international telecom, media and technology companies are meeting at TMT Finance Asia 2018 in Singapore on February 1 to discuss the rapidly changing landscape in technology across Asia and assess the M&A and investment trends and opportunities within the region and globally. Kicking off the day are two highly anticipated addresses, including a Visionary Keynote Speech by Thivanka Rangala, CFO, edotco Group, a leading Asian telecoms infrastructure services company; and a Visionary Keynote Interview with Rangu Salgame, CEO of Warburg Pincus-backed TMT investment vehicle, Princeton Growth Ventures. Key Panel session themes on TMT Leadership, Media and Content, TMT M&A and Mobile Towers and Infrastructure will then follow, and will include leading strategy and finance heads from the region’s largest telecom, media and infrastructure owners, and advisers, including: Telstra, Axiata Group, I Squared Capital, Telkom Indonesia, DTAC, AsiaSat, Indosat Ooredoo, DBS, Goldman Sachs, Mediacorp, iflix, Moodys, Macquarie, edotco Group, Protelindo, Apollo Towers Myanmar, UBS, Linklaters, Intelsat, IFC, Irrawaddy Tower Asset Holding, Hardiman Telecommunications and American Tower Corp.
Asia's top technology companies and investors are also represented, including on the Digital Asia Panel which hosts leaders from Go-Jek, WeWork, Sequoia and SBI Venture Capital, formerly SoftBank Investments. Meanwhile the Innovative Digital Platforms breakout session includes top leaders from most fast-growing tech firms in Southeast Asia such as eatigo, HappyFresh, Zilingo and Gobi Partners. Concluding the day is ‘Asia's Next TMT Titans’ Panel, which will gather five of Asia's most exciting disruptive digital businesses, who will each highlight their growth plans to a panel of expert TMT investment advisers and investors. Also on this year’s expanded agenda, are new session themes on subsectors such as Innovative Platforms, IT Services and Software, Data Centres, IoT and Fintech are also featured on the programme. The event, now in its eighth year, takes places at the Marina Bay Sands Hotel in Singapore on Feb 1, and will gather 200 delegates and 80 speakers from the most active telecom, media and technology companies, investors and advisers in Asia. To secure your place go to http://www.tmtfinance.com/asia/register/. For more information go to http://www.tmtfinance.com/asia/contact.